I have been blessed to be the coordinator for our disaster response mission teams for national disasters for the last 13 years. There have been over 600 Floris UMC team members on 46 teams since Hurricane Katrina destroyed /damaged 800,000 housing units in August 2005. Volunteers have supported relief and recovery from numerous disasters (tornadoes and hurricanes) in Mississippi, Florida, South Carolina, North Carolina, Virginia, New Jersey and New York. While 600 team members may seem like an impressive number of people from one church, the number does not reflect the actual number of volunteers, since many team members have been on multiple trips/teams (some have been on 30+ teams). Bottom line is while we have many tried and true volunteers who have gained great experience and skills over the last 13 years, what we do not have is a steady stream of new volunteers joining these experienced volunteers on teams. One reason may be that some folks are intimidated by their idea that they are not talented enough to be on a team. I want to assure everyone that what we need is people of ALL experience levels! Our experienced volunteers enjoy sharing with and training new volunteers. People who begin trips as novices are dependable workers after the first day of the trip. To quote Neal A. Maxwell: “God does not begin by asking our ability, only our availability, and if we prove our dependability, God will increase our capability”. Please read the two blogs below. They are written by two people who were the only two members of a 9 person Recovery team recently responding to Hurricanes Matthew and Irma in Florida, who were new to Disaster Response teams. They provide a great “newbie” description of what it is like to be the inexperienced members of a Disaster Response Team (newbie is a term previous new team members applied to themselves). I know they will be on future teams, will never be called newbies again, and will never forget the spiritual experience of working with Diane and Norman. And they will probably help train “newbies” on future teams. I hope you will be one of them. I know you will see God in the faces of people like Diane and Norman! In 2019 we will be sending teams to North Carolina to respond to Hurricane Florence and Florida to continue to respond to Hurricane Irma. Look forward to seeing you on one of the teams! At an informational meeting about the church, Tom spoke about the twofold directions of Christian service: service inside the church and service to the vulnerable. I had this in my mind when, on a more recent Sunday, Tom announced the mission trip to help those whose homes had been damaged by hurricane. I felt called to help. Having never been on a mission trip before, I didn’t know what to expect. Certainly, I expected to see flood damage, but a dimension of the mission that had not occurred to me was that homeowners would not qualify for assistance by the United Methodist Volunteers in Mission (UMVIM) unless they were financially unable to do the repairs themselves. I was unprepared for the standard of living we witnessed in the homes we visited. I live in Fairfax County, a location of great affluence, in a country whose standard of living is greater than in most areas of the world. It simply hadn’t occurred to me to expect people living so far below the poverty line, people isolated due to disability or lack of transportation. Our team leader, Tim, encouraged us to listen, to talk with the homeowners as much as they wished to talk. I am grateful for this encouragement, because I am normally shy and introverted, and I would not have gotten to know the people for whom we worked, otherwise. I spent every day we were there with Diane, grandmother to two grandchildren living with her, whose roof had leaked in many places in her house and needed to be repaired. Jill, from our team, introduced me to cutting and attaching sheet rock and to “mudding” it, to make the transition between the old and new smooth. We then taped the joined places and mudded them some more. Paul taught me how to sand the dried mud and prime the ceiling for later painting. I also worked on the walls and ceiling of Norm’s house, which he referred to as his “little slice of heaven.” His roof had leaked so badly that it had been partially replaced by a team previous to us, but the insulation and sheet rock beneath it needed to be replaced by our team. Steve, among others, taught me how to install laminate flooring at Norm’s house. At Sandra’s house, we moved her furniture and belongings from her screened-in porch back into the house. (They had been displaced by an earlier team.) Sandra’s heart is so big, she had taken in all of the stray cats in her area, in addition to keeping her own cats. I enjoyed working side-by-side with Tim, Jill, Paul, Steve, Lee, Coury, Mike, and Thomas. It was hard work, but it was needed work, and I felt blessed to be given the opportunity to be a part of it. Some of my favorite times during the trip were the meals in the church kitchen. That’s when we gathered as a group and cooked and talked and relaxed, getting to know each other. We ate out together when we could not eat at the church, and we took our lunches at the work sites. Each time, everyone swapped stories about previous mission trips, our families, and our experiences with Floris. We went to church together on Sunday morning, singing and praying together like the little family it felt like we were. I can do all things through Christ who strengthens me, even when I don’t think I have a thing to offer… a blog about my mission trip to Florida and, specifically, about one of four families that my team was able to help in some small way. I've been on three prior mission trips outside the U.S., but never thought I'd have much to offer on the "construction" trips for hurricane relief because I am not a handyman or contractor. Norman is a 68 year old man who lives on a one acre parcel of land outside of St. Augustine, Florida. 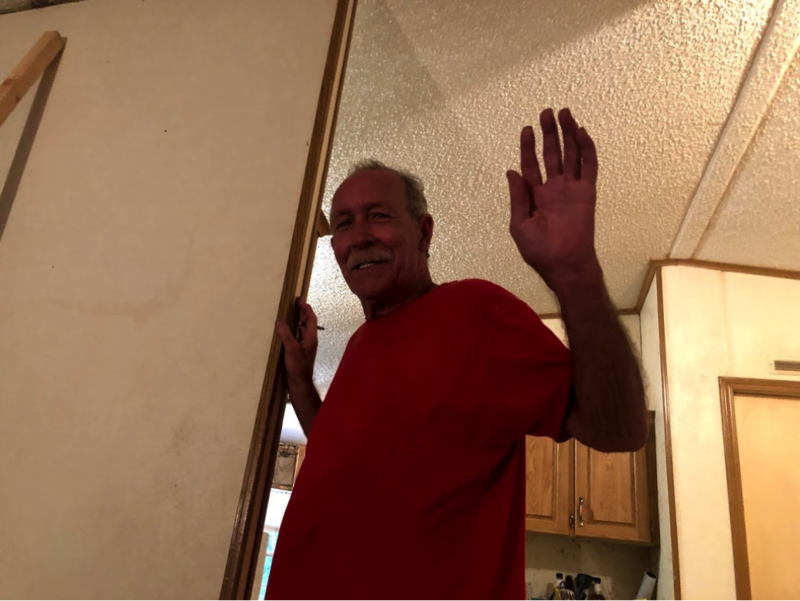 Three years ago, his manufactured home was affected by Hurricane Matthew and a year ago he was hit a second time by Hurricane Irma. His roof was stricken by downed trees from both storms and water then poured into his living room, kitchen and entryway – for three years. Over the past three years, Norman’s home became a cesspool for mold and mildew in the attic, in the walls and beneath the flooring. Norman said he had severe breathing difficulties and his sinuses were causing him health problems due to the condition of his home. Norman survives on less than $8,500.00 per year in social security benefits and $42.00 per month in food stamps. His property taxes alone were costing him $720.27. Norman has a car that does not run and he is not employable. He relies on people to take him places, bring him food and to generally care for him, but Norman wouldn’t tell you that as he is outwardly proud and independent. Norman was directed by a friend to apply to UMVIM through a local Methodist Church for hurricane relief for missionaries to come to his home and help fix up what he was unable to pay for or fix himself, and which he was unable to qualify for under the FEMA requirements. UMVIM helps fix up and rehabilitate homes for the needy that can’t otherwise take care of or afford repairs on their own. In the weeks leading up to my first mission trip to St. Augustine, another team worked on Norman’s house to tear off his roof and put a new metal roof on his home. They also tore out the walls along 50 feet of his manufactured home, about four feet of popcorn ceiling, and they removed the insulation and carpeting. When our team arrived, we had the pleasure of spending time with Norman. We got to know him and his home. For several days, we put up new insulation in his roof and walls, we put in new drywall on the ceiling and walls, and we put in new engineered wood flooring for him. Perhaps it doesn’t sound like a lot, but it was indeed a lot of work. There were only nine of us on the team and we were spread thin among four different jobs throughout our mission trip; however, there was always one much more experienced team member with us to show us newbies what to do and how to do it. I was shocked by the grace of my team members who took extreme amounts of time (over and over again) to show me how to do the job I was there to do. Prior to this trip, I had zero experience doing flooring, insulation or drywall, but now I can say with confidence I could take many more of these trips and be much more useful doing the same types of work. For years, I passed up hurricane relief effort mission trips because thought I had nothing to offer. I was very wrong. Sometimes, the experts need someone to do the simple things so they can focus on the more complex things - they need helpers to fetch them the right tools, or to hold something, or to point the flashlight in the right direction, or to get them water. More often, I learned they teach you to do their job, they show you how to put in the insulation, to measure and cut drywall, to put the drywall up, to mud the drywall and put up tape strips where seams are, and then to come back day after day to re-mud after the first and subsequent coats dry, and to put in those wood floors. Norman is a child of God. He is a human being. He is one of us. He is personable and talkative, yet private and happy. He loves his one acre of land, his manufactured home and his little outbuildings that he personally built, but never finished. He told me it was his little piece of Heaven on Earth. He has lived there for 28 years and personally planted over a hundred maple trees in the midst of all his oak and palmetto trees. He had plants everywhere and you could often see him outside weeding around the house and among the plants. He said he often spends two to three hours a day caring for his land. Lastly, and perhaps outside the scope of what a team member sometimes does, I sat with Norman and discussed his age and income with respect to his property taxes. With a few minutes of research, we were able to determine that Norman qualifies for tax relief that will now reduce his annual tax liability from $720.27 to only $128.22, and we were able to steer him in the direction of other government and local benefits for food and clothing. I could feel God's presence with us during the entire trip. It was amazing to see how He shows His face in the midst of destruction. Norman was always smiling and thankful; he never seemed discouraged. God used our hands to get the job done and it was a blessing and a humbling experience to help others. It was a pleasure to work with and get to know my team, some of whom had been on several of these trips before me. Our group embodied synergy, love, trust, guidance and teamwork. My relationship with eight strangers from my church was strengthened throughout this mission trip. Most of all, I learned that these hurricane and tornado relief trips need people of all ages to go on the trips -- there is NO experience necessary and the leaders of the trips teach you what to do every step of the way. May God bless Norman and watch over him and his property. I reminded myself of this verse as I started out my very first mission trip Thursday, May 24, 2018. I started out not knowing anyone at all on my mission team and I definitely did not have any construction skills to help rebuild houses in Virginia Beach affected by Hurricane Matthew in 2016. All I knew was that I wanted to serve others and learn from others who I met on this trip. I went in with an open mind and an open heart. I knew God was with me - that's all I needed. What happened on this trip was nothing short of life-changing. I learned how to install flooring and use power tools. But, most of all, I learned about others on my mission team, the families we were serving, myself and God. My relationship with God deepened during this trip. I prayed relentlessly for God to convey his love through me so that others would be helped. I talked to the owner of one of the houses and it was so nice to relate to her and to form a bond with her. She thanked us so much for our work. When we completed one of the houses, I looked at our work and told myself, "I helped do that." I was in awe of what God did through me. I was pushed outside of my comfort zone and what happened? I grew and expanded to encompass a love for others and God beyond all measure. God used me to do great things on this trip. I learned a lot about myself, too. I am capable of anything as long as I walk with God and pray for his power and strength to be revealed to me. My drive to serve God at all times was strengthened. I live for him and nothing less. This trip also helped me see that life is not about all the small details that we get stuck in and which make us lose focus on what truly matters. Life is about service, love, grace, forgiveness and letting God transform our lives into beautiful tapestries. I now want to go on more mission trips and continue my love for serving others, learning from those around me, and listening to how God is speaking to me through his children.